Vat Phou (or Wat Phu; Lao: ວັດພູ [wāt pʰúː] temple-mountain) is a ruined Khmer Hindu temple complex in southern Laos. It is at the base of mount Phou Khao, some 6 kilometres (3.7 mi) from the Mekong in Champasak Province. There was a temple on the site as early as the 5th century, but the surviving structures date from the 11th to 13th centuries. It has a unique structure: The elements lead to a shrine where a lingam dedicated to Lord Shiva was bathed in water from a mountain spring. The site later became a centre of Theravada Buddhist worship, which it remains today. Phou Khao has a natural lingam on its peak. Vat Phou was initially associated with the city of Shrestapura,:66 which lay on the bank of the Mekong directly east of Lingaparvata Mountain (now called Phou Khao). By the latter part of the fifth century, the city was the capital of a kingdom that texts and inscriptions connect with the Chenla Kingdom and Champa. The first structure on the mountain was constructed around this time. 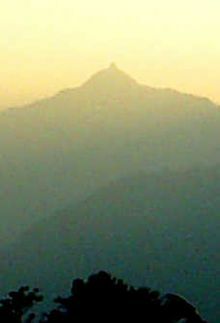 The mountain gained spiritual importance from the lingam-shaped protuberance on its summit. The mountain itself was, therefore, considered the home of Shiva, and the river as representing the ocean or the Ganges. The temple was naturally dedicated to Shiva, while the water from the spring directly behind the temple was considered sacred. Vat Phou was a part of the Khmer Empire centred on Angkor to the southwest, at least as early as the reign of Yasovarman I in the early 10th century. Shrestapura was superseded by a new city in the Angkorian period, directly south of the temple. In the later period, the original buildings were replaced, re-using some of the stone blocks; the temple now seen was built primarily during the Koh Ker and Baphuon periods of the 11th century. Minor changes were made during the following two centuries, before the temple, like most in the empire, was converted to Theravada Buddhist use. This continued after the area came under control of the Lao, and a festival is held on the site each February. Little restoration work has been done, other than the restoration of boundary posts along the path. Vat Phou was designated a World Heritage Site in 2001. The facade of the sanctuary. The Buddha image inside is modern, and the site is used for religious worship today. Like most Khmer temples, Vat Phou is oriented towards the east, although the axis faces eight degrees south of due east, being determined primarily by the orientation of the mountain and the river. Including the barays (reservoirs), it stretches 1.4 kilometres (0.87 mi) east from the source of the spring, at the base of a cliff 100 metres (330 ft) up the hill. 6 kilometres (3.7 mi) east of the temple, on the west bank of the Mekong, lay the city, while a road south from the temple itself led to other temples and ultimately to the city of Angkor. A plan of Vat Phou: proportions and positions are approximate. Approached from the city (of which little remains), the first part of the temple reached is a series of barays. Only one now contains water, the 600 by 200 m middle baray which lies directly along the temple's axis; there were reservoirs north and south of this, and a further pair on each side of the causeway between the middle baray and the palaces. The two palaces stand on a terrace on either side of the axis. They are known as the north and south palaces or, without any evidence, the men's and women's palaces (the term "palace" is a mere convention — their purpose is unknown). Each consisted of a rectangular courtyard with a corridor and entrance on the side towards the axis, and false doors at the east and west ends. The courtyards of both buildings have laterite walls. The walls of the northern palace's corridor are laterite, while those of the southern palace are sandstone. The northern building is now in better condition. The palaces are notable chiefly for their pediments and lintels, which are in the early Angkor Wat style. Carving of a crocodile on the upper level, possibly the site of an annual human sacrifice in pre-Angkorian times. The next terrace has a small shrine to Nandi (Shiva's mount) to the south, in poor condition. The road connecting Vat Phou to Angkor ran south from this temple. Continuing west, successive staircases lead up further terraces; between them stands a dvarapala which has come to be worshiped as king Kammatha, mythical builder of the temple. On the narrow next terrace are the remains of six small shrines destroyed by treasure-hunters. A lintel showing Vishnu on Garuda, on the northeast wall of the sanctuary. The path culminates in seven sandstone tiers which rise to the upper terrace and central sanctuary. The sanctuary is in two parts. The front section, of sandstone, is now occupied by four Buddha images, while the brick rear part, which formerly contained the central lingam, is empty. The entire roof is missing, although a makeshift covering has been added to the front. Water from the spring which emerges from the cliff about 60 m southwest of the sanctuary was channeled along stone aqueducts into the rear chamber, continuously bathing the lingam. The sanctuary is later than the north and south palaces, belonging to the Baphuon period of the later 11th century. The east side has three doorways: from south to north, their pediments show Krishna defeating the nāga Kaliya; Indra riding Airavata; and Vishnu riding Garuda. The east wall bears dvarapalas and devatas. Entrances to the south and north have inner and outer lintels, including one to the south of Krishna ripping Kamsa apart. A lintel showing Krishna killing Kamsa, on the south wall of the sanctuary. Other features of the area are a library, in poor condition, south of the sanctuary, and a relief of the Trimurti to the northwest. There are other carvings further north: a Buddha footprint on the cliff face and boulders shaped to resemble elephants and a crocodile. The crocodile stone has acquired some notoriety as being possibly the site of an annual human sacrifice described in a sixth-century Chinese text. The identification is lent some plausibility by the similarity of the crocodile's dimensions to those of a human. Global Heritage Fund, in association with the Lerici Institute (Italy) and the government of Laos, is providing emergency conservation of temple structures at this largest of archaeological sites in Laos. The stabilization and sustained conservation of Nandin Hall is the primary focus of these efforts. However, the Global Heritage Fund-led team is working with local communities for training and development. 2005-2012: French-Lao cooperation project (French Ministry of Foreign and European Affairs / Lao Ministryof Information and Culture): Priority Solidarity Funds "Vat Phou-Champasak, enhancement and development of the historical and cultural heritage" (FSP 2005-75). This project included restoration of the northern hall of the southern quadrangle (palace), cultural project on the intangible heritage of Champasak: Rediscovery of the Champasak Shadow Puppet Theatre and organization of a theatre tour in the villages of the district of Champasak accompanied by Cinema Tuk-tuk, Layout of the 'Sala' and surroundings of Vat Phou site. Objectives of the project were: institutional support for the creation of a body specialized management of the site, training of the scientific, technical and administrative staff, and development of the site and its economic valuation. 2009: Restoration project for the northern palace by the Archaeological Survey of India (ASI). The Indian Team from Archaeological survey of India, headed by Er. R. S. Jamwal, conducted studies of foundations, drainage problems, super structural elements as well as did the documentation, recording, survey work etc. for the Northern Quadrangle of temple complex. The conservation and Restoration work of Northern Quadrangle is likely to be commenced from ensuing working season. 2010: Restoration project for the southern palace, with Jean-Marc Houlteau, stonemason. 2011: Restoration project for the southern quadrangle (palace), with Jean-Marc Simon-Bernardini and Johann Gautreau, stonemasons. 2014: Non-intrusive stone analyses, by Christian Fischer. Today the site is open to the public for religious activities and tourist visits. Hours are 08:00–18:00, and the entrance fee is 50.000 LAK. The site features a museum which houses artifacts of the temple complex of several centuries, such as statues of Shiva, Vishnu and Nandin, as well as Buddhist statues. The museum building has been limited to a specific size to minimize altering the underground site and the view. ^ Centre, UNESCO World Heritage. "Vat Phou and Associated Ancient Settlements within the Champasak Cultural Landscape". whc.unesco.org. Retrieved 2017-08-06. ^ bazin, david. "Scientifics missions". vatphou-champassak.com. Archived from the original on 2017-02-02. Retrieved 2017-01-22. ^ Administrator. "Schedule and Fees". www.vatphou-champassak.com. Archived from the original on 2017-02-02. Retrieved 2017-01-22. ^ Vat Phou Champassak World Heritage Department (2012). Vat Phou Champassak. The Temple of the Mountain. Visitor's Guide. Vat Phou Champassak World Heritage Department. ISBN 978-9932-000-62-3. ^ Administrator. "Exhibition Hall". www.vatphou-champassak.com. Archived from the original on 2017-02-02. Retrieved 2017-01-22. ^ Projet de Recherches en Archaeologie Lao. Vat Phu: The Ancient City, The Sanctuary, The Spring (pamphlet). ^ Freeman, A Guide to Khmer Temples in Thailand and Laos p. 200-201. ^ ICOMOS report p. 71. ^ ICOMOS report p. 72. ^ Global Heritage Fund - Where We Work - Wat Phu, Laos Accessed on 2009-04-28. O. Nalesini, «Wat Phu», in Enciclopedia archeologica. Asia, Roma 2005. Recherches nouvelles sur le Laos - EFEO(école française d'extrême orient) - Yves Goudineau & Michel Lorrillard - 2008 - 678 pages. This page was last edited on 20 August 2018, at 17:29 (UTC).